It is hard to believe, but it is that time of year once again and spring has officially sprung. This year, Old Man Winter was showing his age and moving at a snail's pace. As you may know, the Pacific Northwest experienced very mild temperatures throughout the closing two months of 2018. On the 27th of January, the fly fishing city of Ellensburg recorded a high temperature of 58 degrees. I am not certain that this a weather record, but January is typically our coldest month of the year, where nighttime lows can be well below zero. Three days later, we had eight inches of snow accumulations on the ground and the bone chilling cold thereafter. Snow accrual kept on dropping and a record-breaking day of precipitation in the mountains was recorded, as winter storms pummeled the Cascade Mountain Range between Kittitas and the metropolis of Seattle. Water reserves are always an issue every season as we theorize on what weather patterns will prevail over the Pacific Northwest during this time frame. There is now a much higher demand on water reserves on a seasonal basis from Kittitas County to Benton County then ever. Like usual, spring rolls into Central Washington like a lion. The weather progresses from one extreme to the next very quickly. For example, average day time temperatures will range in the 30's and the following day it's 65 degrees. When this occurs, winter's low lying, snow pack in the hills surrounding the river valley begin to rapidly dissolve. As the ground unfreezes, it will begin to absorb and neutralize as much of the snow as possible, recharging the ground water aquifer. Once this is complete, the melting snows have no where left to seep and the remaining remenants of winter, eventually collide with the river. This water is delivered by its many smaller tributaries that feed water along its course, as it flows south, towards the Columbia River. These small feeder streams of course converge with Washington State's only Blue Ribbon trout stream, crashing into it with vast amounts of cool, milky water, creating un-idealic fishing conditions. That is exactly what occurred during the month of March. Spring fishing on the Yakima River is always touch and go and solely dependant on water and weather conditions. If you are prepared and can hit it when the river is stable, it can be some of our best fishing of the year. However, warm weather and rain are never a good combination for keeping our rivers intact in the spring, when low lying snow pack or high elevation snows are still present. There are two important tidbits of information that I can bestow upon you today in this spring newsletter to monitor if you would like to experience fly fishing the Yakima River in the spring. (1) One; utilized the WBFC Pro-Shop and call for a daily river conditions update before heading out. If the river is in good fishing condition, our guide staff is out every day and is aware of the current state of the river. Our, professional, freindly staff will provide you with an honest account of the fishing statuses. 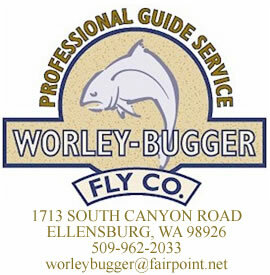 (2) Two; If you haven't already, bookmark www.worelybuggerflyco.com as well as the Yakima River Conditions page. Here, you will find not only current river reports, but also video on the daily situation and current stage of the river. We keep the report page updated daily this time of year and the conditions page is in real time, with gauging station information from the headwaters of the river to the confluence of the Columbia. Here you are getting a visual represention and the instantaneous update state of river flows, for which ever section of the river you are interested in. Keep this in mind as you learn how to read the graphs as the Yakima River is easily wadable at 1800 cfs (cubic feet per second), from the Cle Elum Area to the Lower Yakima River Canyon. If you see it within that range, most likely the river is experiencing a state of accord. If you see flows bouncing all around on the graph, then most likely the river is in fair to unruly condition. If that is the case, I would make plans to fish elsewhere for the day. If you are unsure after reading the grapsh, utilize the information I indicated above. As a Professional Guiding Service, we like to see approximately two feet of water clarity for consistent spring fishing. Low, clear water and bright sun can make for much tougher fishing circumstances, especially with novice or first time fly fishers, any time of the year. 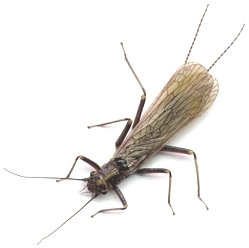 Visit the WBFC You-Tube site and watch our videos on Skwalla Stonefly fishing in April. Take a close look at the river color and you will see what I am implying. The river is going to be touch and go throughout April due to more snow pack melt. The low elevation snow around the river has burned out quickly this year. However, the higher snow pack has yet to really begin. As our days progress and get longer and warmer, the snow will begin to thaw and be delivered once again to the Yakima. Get out and fish if you can during the prime days! If not, Central Washington has endless seasonal fishing oppurtunities with a fly rod. We will begin pursuing bass, Tiger Muskie and Northern Pike in April, so watch the site for that info as well. Each year on March 1st, signals the start of the Columbia Desert Unit Lake opener, when many of the popular Stillwater fisheries open for the season. This year, the majority of them were still confined under several inches of rock hard ice, on the state�s sanctioned fishing start. Now that we are three weeks deep into the calendar of March, many of the lakes are just now thawing out. Some of these lakes are completely ice free and others were still frozen as of last Saturday. It is really dependant on their location in the desert and how much sunshine, rain or wind they receive on a daily basis. Many are surrounded by big, basalt cliff faces or sit down in a basin bowl and receive very little direct sunlight. These lakes are still frozen in places or the ice is beginning to melt along the edges where it receives valuable sunshine during the day. Which ever is the case, the die hard lake fishermen were gnawing at the bit, harder than I have seen in quite a few years to fish their favorite piece of water. They are now in route and out exploring, which ever lake is ready to produce an early stillwater experience. If you aren't an experienced lake fishermen, or you are looking for some great information about the Desert Unit, I would encourage you to check out the latest episode of "Guide Chronicles". This is a live-internet radio show that is produced with Ellensburg Community Radio (www.eburgradio.org) on Wednesday evenings at 6:30 pm. If you have an internet connection you can listen or download any of the episodes and listen at your leisure. Last week, my guest in the studio was Grant County PUD Fisheries Biologist, Rod O'connor. Rod is an advanced angler and prefers to fish the many lakes that the Evergreen State has to offfer. We discussed lake fishing in the desert and Rod gave some excellent insights and stratagies for you to incorperate as you begin to explore stillwater fly fishing. Rod will join us again in the fall of the season, to offer more insights on fly fishing stillwaters in the autumn. When the rivers are high and dirty with spring run-off, the stillwater experience is yet another fly fishing experience that will help you grow, learn and become a better, well rounded angler. The species found in lakes are very diverse and learning the lake game gives you another set of options that will get you into the great outdoors. In July of 2018, WBFC marked a milestone in our two decades of operating a fly fishing outfitting service. The start of our hosted travel service began in conjunction with Flywater Travel. Aron Larson and myself, had the pleasure in joining (8) eight friends to the exterior of Alaska, where we enjoyed the hostpiltiy and fishing at the "Fishing Bear Lodge". The trip was such a success that once again, we are traveling north to the "last frontier" of Alaska to revisit the "Fishing Bear Lodge" during the first week of August, 2019. Here, we will enjoy the company of Justin and Kia Johns along with their entire lodge staff for a week of incredible fly fishing in the remote wilderness of the Wood River-Tikchik River State Park, the "Jewel Of Alaska". Located at the mouth of the Peace River, the Fishing Bear Lodge is nestled in the 1.6 million acre park, acclaimed as one of Alaska's most beautiful locations. Visiting this venue myself in 2018, I must agree fully. The scenery is absolutely incredible! Plus, the fly fishing will completely spoil you and the hosts are amazingly friendly and gracious hosts. Today, we have accommadations to include four additional (4) fishermen for the Fishing Bear Lodge trip in 2019. The dates for this Alaska adventure are August 4th thru August 11th. If you are interested in joining us on this incrediable fly fishing experience this August, please contact us at the WBFC Pro-Shop immediately. Since the announcement, the dates for this Alaska adventure have filled quickly. We encourage you to join WBFC for this incrediable oppurtuntiy, to see the beauty and experience the spendor of Alaska, "The Last Frontier". Take part in another exciting adventure to the mecca of saltwater fly fishing on Christmas Island. In May, Aron Larson will host this travel quest to the flats of Kiritimati and fly fish for a variety of exciting and challenging saltwater species. There are only a few open fishing spaces left available for this exciting, travel destination, where the sun is always shining and the average temperature is near 80 degrees daily. If you are interested in joining this trip, please contact us immediately. Time is quickly running out to fill your spot and secure a seat on the airplane. Christmas Island has very limited flight capacities and Fuji Airlines only lands on the island once a week. To learn more about this exciting adventure to the tropics of Christmas Island, I would suggest listening to my in-depth conversation with traveling, fly fishing adventurer, Stefan Piccone on the 15th broadcast of "Guide Chronicles". Stefan spent a week in Christmas Island last April. Stefan will join the WBFC group in May and is readily available to answer any questions about the trip as well. The episode has detailed information on how to and what you can expect during your week on the oasis, fly fishing in the tropical sands of Christmas Island. April is also the time of the year, when the distraction from trout fishing occurs around the WBFC proshop, and we begin setting our sites on a whole different freshwater creature. 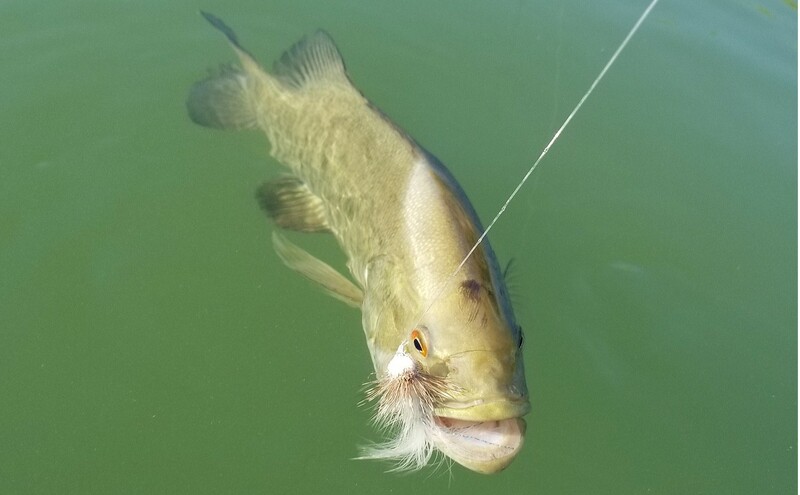 Bass fishing in the Columbia Desert Unit begins as the warmer temperatures sound the alarm and both Smallmouth and Largemouth wake up after a long, cold winter. The bass fishing oppurtunities are endless for the adventerous angler, as we will begin fishing rivers and lakes for this formitable species with flies. Of course, top water fishing with poppers is always a primary choice for catching these fish, however streamer fishing is also a wise option, especially when other baitfish and warmwater species are around. After a long, cold winter baitfish, salmonoids and other small fish are optiomal feed for both species of bass. Smallmouth fishing generally will begin first. However, these fisheries are dicatated soley by water temperatures. Pre-spawn is always an oppurtune time to catch adult, age class bass with flies, because they move from the warmer, deeper climates to the shallow edges and the ideal mating area's. Of course the deeper a fish is, the harder it is for us as fly fishermen to acheive those depths, even with the best sinking lines. Those of course are designed and manufcatured today, by Scienticfic Anglers and we incorporate many of their lines into our bass fishing. 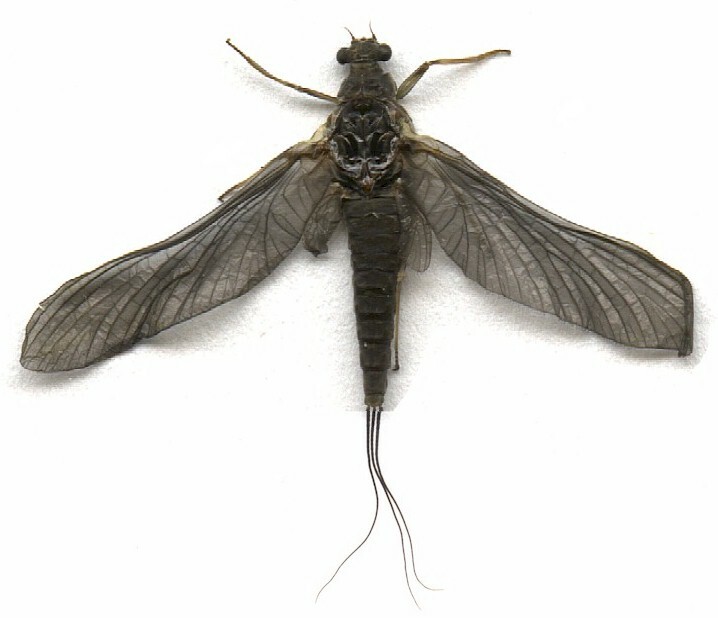 The Lower Yakima River, the mainstem Columbia River, and a host of Desert Unit fisheries all offer excellent fly fishing opportunities to catch this willey, freshwater fish with flies. If you are interested in learning the fine points of catch large bass on a fly, call the professionals at WBFC. Our entire fly fishing staff revels in these types of fishing prospects and are well versed in the art of catching bass on a fly. We would like nothing more then to introuce you to a whole new way of fly fishing. In 1997, Worley Bugger Fly Co. created this exclusive, members only, monthly fly program. The club, with it's membership benefits operated until 2009, with hundreds of memberships. Unfortunately, the club was discontinued because of the inability for WBFC to continue to offer "high" quality, proshop flies each month, at a discounted price. However, that has all changed now. 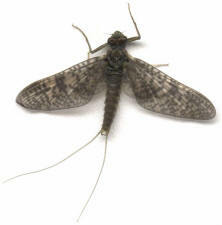 Back by popular demand is the WBFC "Bug Of The Month Club". The remarkable effect that the internet has on our daily lives and our ability to communicate world wide, WBFC is now working directly with several new, high quality, fly tying manufactures and vendors. We are able to resurrect, the Bug Of The Month Club in 2019. Once again, WBFC is offering super, high quality pro shop flies to our members, at discounted prices each month. We have been busy around the WBFC Proshop throughout the winter months, changing the look and feel of the store. It is during these months of the year, when the fishing trend slows a bit and we have time to catch a breathe. During the past few months, we have increased our "fly tying inventory" and added over 400 new sku's of fly tying materials from our distributing partners at Nature's Spirit, Hareline Dubbing, Wapsi Fly, John Rohmer and Hemmingway. We will continue to add more incredible products throughout the year as they become available. You can also shop the WBFC website for most of the material at this time, however we are in the processes of adding the new product as well as cleaning up old files and adding a new, easy to use shopping cart system. Phone orders are always welcome and we appreciate your business greatly. WBFC is also your one stop proshop when traveling to or from Central Washington. We have all the essential fly fishing gear and have added several new companies to the mix this season. WBFC also stocks over 2800 different and unique flies and will soon be adding an additional (12) new drawers of flies to our current existing inventory. Here, we will offer high quality patterns for Muskie, Northern Pike, trout, bass and a variety of saltwater species. Are you aware of the WBFC Customer Rewards Program? The WBFC Professional Guide Team is also offering a host of new and exciting fly fishing adventures around Central Washington this season. Watch the web closely and you will see trips offered for Muskie, Pike, Small and Largemouth Bass as well as classes on Euro Nymphing. Also our new two day, "Trout Camp" will be offered this summer. Information on all of these trips will be posted on the website soon. On Tuesday, March 19th, the Kittitas Valley was stricken with tragedy as one of our finest, first responders, Kittitas County Sheriff's Deputy, Ryan Thompson was killed in the line of duty. Ryan was a family man, outdoorsmen, fly fishermen and all around most excellent person. I knew Ryan as a passionate fishermen, who enjoyed the sport and loved the community that he lived and worked in. Whenever a heartbreaking event like this takes place, we struggle to find any reasoning around it, especially in a close knit community like Ellensburg. The outpouring of support has been nice to see for an event such as this. There have been several memorials set up directly for the family of Deputy Thompson. The fly fishing community always comes together when folks need to be lifted up during times of life's worst moments. You can visit this link below, if you would like to help during their time of need for a fallen hero and his family. Donations Here!